The Intel G33 Express Northbridge chipset replaces the G965 Express as Intel's mainstream integrated core logic part. The G33 Express supports Socket 775 processors running on an 800/1066/1333 MHz Front Side bus which also include's Intel's coming "Penryn" processor. The G33 Express ships with the ICH9 series of Southbridge chipsets. The southbridge used with the ECS G33T-M2 motherboard is the ICH9 model which means the motherboard does not support Intel's Matrix Storage Technology. These changes are largely incremental, the most significant architectural improvement to the G33 Express chipset has been the inclusion of DDR3 RAM support. Initial DDR3 memory modules from Crucial, Corsair and OCZ run at 800 and 1066 MHz speeds, as the standard matures it's will go to 1333MHz. 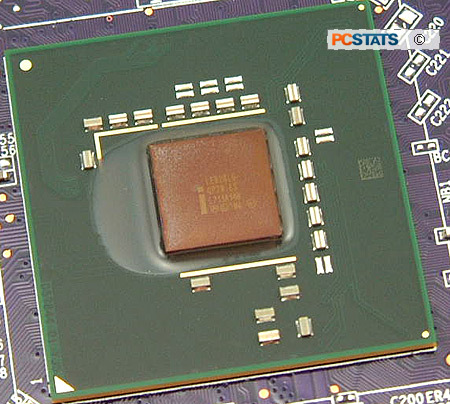 The ECS G33T-M2 does not support DDR3 as the standard is not slated to become mainstream till mid 2008. Come that time though, you cannot install DDR3 memory into the G33T-M2, the DDR3 standard is not compatible with DDR2. The Intel G33 Express supports a maximum of 8GB of non ECC unbuffered memory, either DDR3 or DDR2, depending on what the manufacturer has chosen to implement. Here's a quick look at how the new G33 stacks up to the G965 Express chipsets. Apart from the speed increases and new memory standard, there are really just a few extra ports here and there. The Intel G33 Express chipset supports an onboard videocard dubbed GMA X3100. We'll get into the features of the new videocard shortly, but first a bit more on the Intel G33 Express. There's PCI Express x16 support for a standalone videocard if you find the onboard video lacking. For instance the GMA X3100 is too slow for gaming, so if that's in your cards you'll want to install something else. The Intel ICH9 southbridge supports up to six PCI Express x1 slots, although there's only one on the ECS G33T-M2. It is up to the motherboard manufacturer to determine how many PCI Express x1 slots to implement. A dedicated 2GB/s I/O bus connects the Intel G33 Express Northbridge and ICH9 Southbridge together, which might be a little tight if you have many high bandwidth devices installed but should be just fine for the average user. The ECS G33T-M2 motherboard comes equipped with the ICH9 Southbridge which means it does not support any forms of RAID. The Southbridge supports six 3GB/s Serial ATA II channels (although the G33T-M2 motherboard only has four) as well a 7.1 channel Intel Azalia high definition audio, 12 USB 2.0 ports in total (split between headers and the I/O slot), six PCI Express x1 lanes, and an integrated Intel Gigabit MAC that runs through the PCI Express bus. Noticeably lacking from the chipset itself is parallel IDE support. Most motherboard manufacturers are integrating stand alone IDE controllers however the ECS G33T-M2 does not have any IDE support whatsoever. Good thing Serial ATA optical drives can be had easily for around $40 CDN.